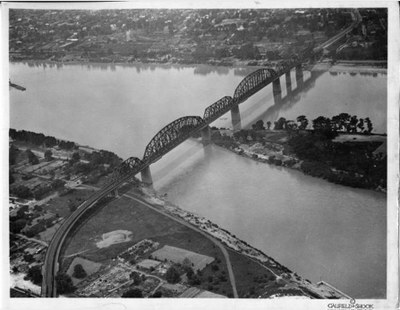 More than a century ago, the western area of Louisville, Kentucky known as Portland was the site of one of eastern North America's most important archaeological discoveries. In the 1830s, during the first attempt to dig a Portland Canal that would convey river traffic around the Falls of the Ohio River at Louisville, excavators unearthed the bones of a mastodon (a woolly elephant) dating back to the Ice Age, along with the stone spear points that local hunters had used to kill and butcher the animal. Following that early settlement, Portland was home to many generations of hunting and gathering groups, and then to the early farmers who brought corn, pottery, and settled village life to this area. With the arrival of European settlers, Portland was developed almost as early as Louisville, but as a separate town. Remains of 19th century streets, houses, cisterns, and artifacts are still preserved beneath the modern city-scape.